Your hectic work schedule might not allow you to spend as much time with your pawed friend as you want to. 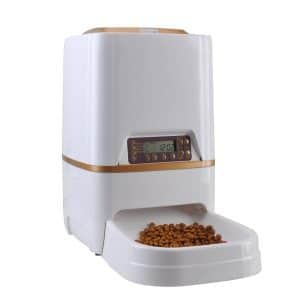 Therefore, having the best automatic dog feeder with timer could save you a lot of trouble if you stay up late for work or have to skip town for a couple of days. After conducting a thorough market research, Dr. Fox has concluded that the right item for your needs is the Westlink 6L Automatic. It comes with a built-in voice recorder that allows you to display a personal 10-second voicemail, it fits a lot of different dry foods and allows you to opt for up to 4 meals a day, each dispensing up to 39 portions. If this item is not available for sale right away, a good alternative would be the PetSafe Healthy. With a total bowl capacity of 6 liters (202 fl.oz. ), the dispenser can provide up to four meals a day, each meal with portions varying from 0.35 ounces to 13 ounces. It allows you to register a 10-second voicemail to let your pet know when it’s time to eat. It fits many sizes and shapes of dry food. Some customers say the voicemail recorded is of poor quality and garbled. The noise that this machine does could scare off your pets. This product does the job for you, especially if you need to watch your dog’s diet or you’re out most of the day. The Immediate Feed Mode allows you to instantly offer another meal to your dog outside the feeding schedule, while the Pause Feed Mode will temporarily stop feeding without losing previous settings. 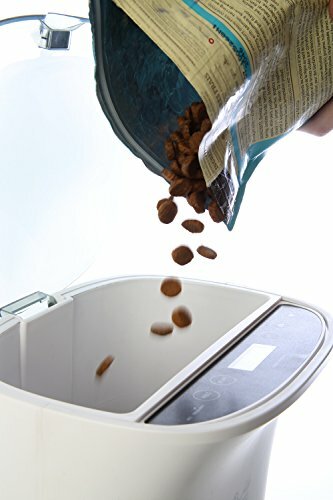 The product allows you to dispense various sizes of portions, according to your pet’s needs. It is sturdy and silent. Although made of high-quality materials, we don’t advise you to use this product outdoor as it is not weatherproof and might break. 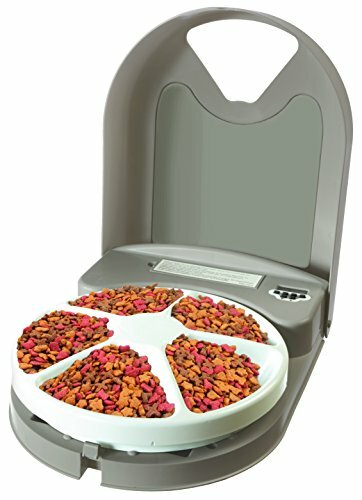 Safe and easy to use, this food dispenser is your ally if you have a hectic schedule and can’t feed the pets yourself. The large container stores up to 7 liters (236 fl.oz.) of food. The built-in programmable timer allows you to schedule up to four feedings per day. It features a large LCD screen and control buttons that are easy to use. It runs with batteries and electric energy. You can record a customized message for your pet. When ordering this automatic feeder, keep in mind that the batteries are not included. The voice message played is of inferior quality. Reliable and sturdy, you can count on this item to adjust your dog’s diet according to its needs. 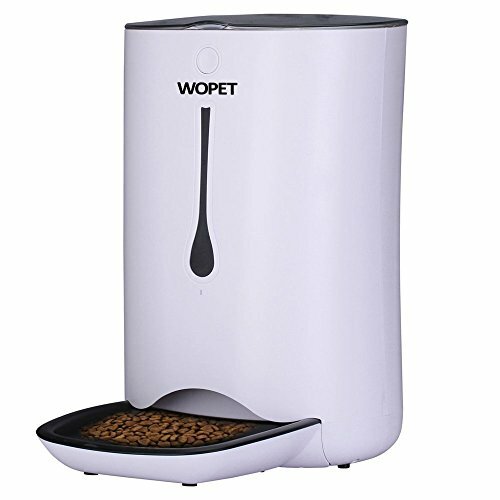 If you are busy with your work but still want to come home to a loving pet, this automatic feeder is the right choice for you. It has a total capacity of 6 liters, more than enough to store food for up to a few days! You can program it to release up to four scheduled meals per day, each meal containing a maximum of 39 portions of food, depending on the number of pets you have or how big they are. We liked that it can fit numerous shapes and sizes of puppy kibble so that your pet receives the best nutrients and ingredients for a healthy growth. And if your pet feels lonely during the day, perhaps the voicemail feature will make it happier. This recordable voicemail option allows you to record a 10-second message, calling your pet for lunch or dinner. It runs on batteries or can be USB-powered and has very low power consumption. Therefore, it is a convenient option that won’t add too much to your monthly bills. The built-in infrared detection will prevent spills and dispensing food when the container is not empty. It allows you to record a small voicemail to determine your pet to eat while you’re gone. We also liked that you can feed various types of kibbles, so your dog can receive a fully customized diet, based on its needs, age, and weight. Although most of the customers who ordered this product were pleased with its features and ease of use, some state that the quality of the voicemail is questionable, as the voice won’t be heard loud and clear. Ultimately, this could confuse your pet more. Don’t forget to purchase your own batteries as they are not included in the package. The product has a large capacity that holds up to 24 cups of dry food for your pet, while the bowl can be filled with 5 cups of food, perfect for one portion. 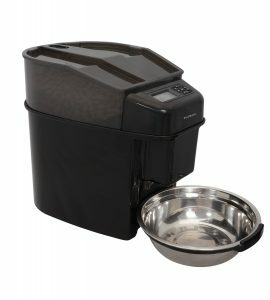 Unlike other products, this automatic feeder allows you to program up to 12 meals, depending on your pet’s schedule. The Immediate Feed mode enables you to serve an additional food portion outside the regular feeding hours, while the Pause Feed mode will temporarily stop the feeding without losing the preprogrammed settings. The Slow Food option is also great because you can set the product to slowly dispense food over a 15 minute period to avoid bloating, overeating or vomiting. Another thing that we liked about this feeder is that meals can be dispensed in various sizes, from ⅛ cups to 4 cups, depending on your pet’s size, breed, age, and necessities. Therefore, it makes a great option if you plan on feeding your dog food for weight loss. Why settle for cheap automatic dog feeders with timer when you can enjoy this product that is both affordable and efficient? In addition, the lid, bowl, bowl-holder, and the hopper are removable and dishwasher-safe, meaning you can clean them in just a few minutes. It comes with various settings for timing, portions, and others. You can feed up to 4 cups of food per meal or narrow it down to ⅛ of a cup if you have a puppy or need to look over your doggo’s diet. The product features a reliable design that dispenses almost all sizes and shapes of dry and semi-moist food for a complete and balanced nutrition. It is easy to clean as most of its parts are removable and dishwasher safe. Therefore, you can also look after your pet’s hygiene and avoid bacteria or pests. The item is made of stainless steel and BPA-free plastic. The product doesn’t allow you to record a video or a voice message as other dispensers do in the same price range. Making this dispenser work according to your specifications is quite the hustle, taking up to two days. You must carefully read the instructions and go through all the setting options until finding the right ones for your pet. This item is perfect for dispensing the right amount of food for puppies or adult dogs. You can schedule up to 4 feedings per day with the built-in programmable timer. With just a push of a button, you can program each feeding in advance, according to your pet’s requirements, so you can keep an eye on its diet. 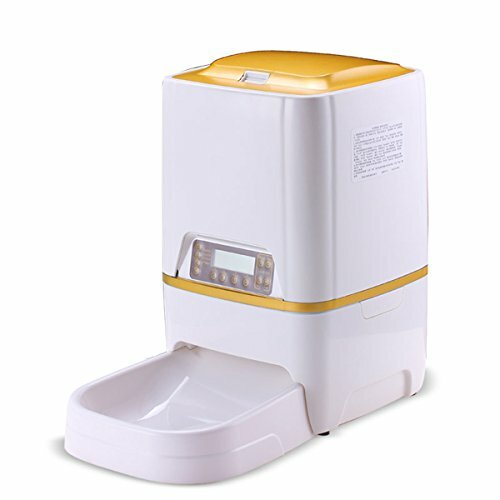 The dispenser comes with a big LCD screen that is easy to operate. It can be plugged into a regular power socket or can run on batteries, which is great in case of a power outage or natural disaster. The food portions differ from 2 teaspoons to 4.5 cups of food, based on your pet’s size, breed, age, and diet requirements. The number one benefit of the feeder is that your dog or cat could eat at regular hours and establish a healthy routine. What we also liked about this particular item is that it allows you to record a custom message for your pet. All you have to do is press and hold the mic button for three seconds before beginning and then record the message that you wish to be played each time the dispenser releases food. This way your pet will miss you less, and he or she will become more excited about the feeding hours. The item comes with various functions to ensure a fully customized feeding routine for your cat or dog. You can control each portion of food according to your pet’s dietary plan, size, weight, and age. The feeder dispenses up to 4.5 cups of dry food per serving to ensure a healthy growth and a balanced nutrition. You can even record your own voice message so your dog won’t miss you that much during your long hours at work. It runs on electricity or batteries so your pet will never skip a meal, no matter the weather conditions or other external factors. You’ll have to purchase the batteries separately if you want to make this product work. Also, the item is only suitable for dry food and won’t dispense semi-moist or wet food in the bowl. For a balanced and complete nutrition, we suggest combining dry kibbles with high-quality home cooked organic dog food and supplements, including small portions of dog foods with probiotics. This compact and convenient food dispenser is easy to use and can be packed with you anywhere you go. You can continue with your busy schedule without constantly worrying about feeding your pet when you’re away. 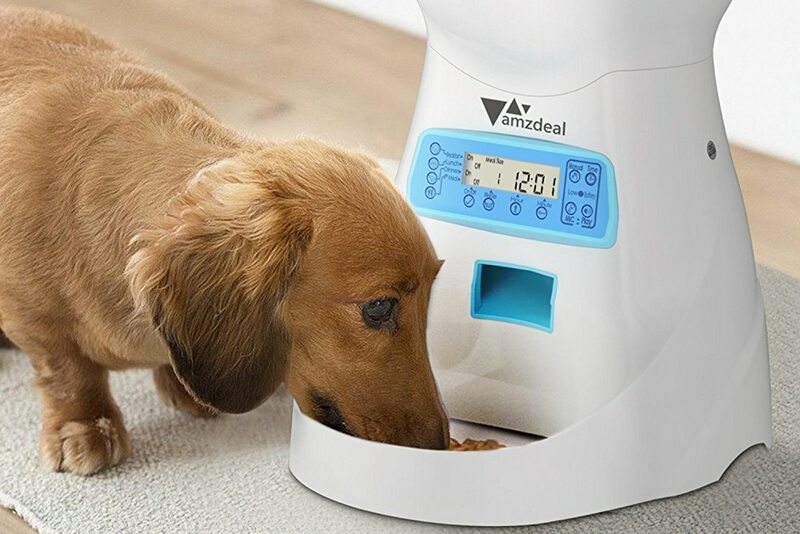 The item automatically feeds up to 4 meals per day, each portion containing a pre-programmed amount of food, according to your specifications and your dog’s requirements. You’ll easily set it up and make it work in under 10 minutes. The dispenser is equipped with a built-in digital clock and a large LCD screen which makes operating it a piece of cake. What we liked about this product is that you can also feed semi-moist cat or dog food, apart from the traditional dry kibbles. Therefore, your pet will enjoy a juicier, healthier, and more nutritious meal. It is made of BPA-free plastic and comes with removable parts that allow you to wash it in under five minutes and always keep it clean. In addition, the tray carousel can be placed directly in your dishwasher and cleaned with the rest of your dishes and cutlery. The item is very easy to set up and provides an efficient feeding for your pet whenever you’re not at home. You can opt for up to 4 pre-portioned meals a day, depending on your pet’s diet. It comes with a built-in digital clock and a large LCD display for a user-friendly interface. 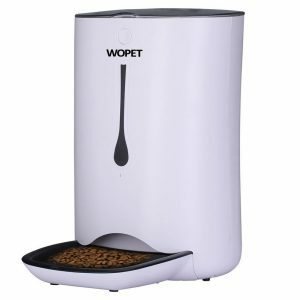 One of the excellent features of this product is that it allows you to add dry and semi-moist food, unlike other food dispensers that only release dry kibbles. Therefore, your pet will benefit from a healthy and complete nutrition. It runs both on electricity from power sockets and batteries. As with many other similar products, this one doesn’t come with included batteries either. It would be best to purchase them on your own to make sure the item runs in all conditions. The food dispenser doesn’t allow you to record a voice or video message to display whenever your pet needs to eat. The item comes with a sleek and modern design that will fit most new-generation kitchens. The elegant black and white feeder will match the rest of your kitchen appliances and house decor. 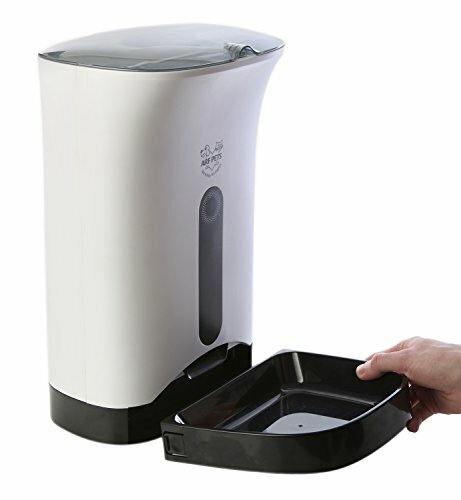 It dispenses 1-10 portions of food per meal, each portion measuring 8 ounces. You can pre-program the machine to distribute up to four meals per day, depending on your pet’s dietary requirements. Therefore, your furry friend will benefit from the right amount of food each time, reducing the risk of overweight, obesity, and other health problems associated with them. The item comes with plenty of functions and is easy to customize based on your dog’s preferences. The dispenser features a large LCD screen and a built-in clock that are easy to read. It runs both on 3D batteries and regular energy. What we liked the most about this particular product is that it was designed both for pets and humans. The safety magnetic lid ensures your pets won’t break into their food stash, while the built-in recorder gives the owners the opportunity to record a 10-second message that will be played each time your pet needs to eat. The item is made to last. Crafted from high-quality materials, the sturdy design is pet-proof and resistant to wear, meaning your dog or cat won’t scratch it or destroy it easily. The built-in microphone allows you to record a voice message to call your pets for lunch. This is a cool feature for busy people who don’t get to spend too much time with their pets, but still want to make them feel loved and as comfortable as possible. The feeder has a total capacity of 1.14 gallons, large enough to provide food for one pet for multiple days. The item is also fully customizable, making sure your dog or cat receives a balanced and nutritious meal. Some customers say the food gets stuck in the dispenser quite often, so you have to make sure the kibbles you purchase are small enough to fit. This could prove a struggle, especially if you have an adult dog that is used to larger kibbles. 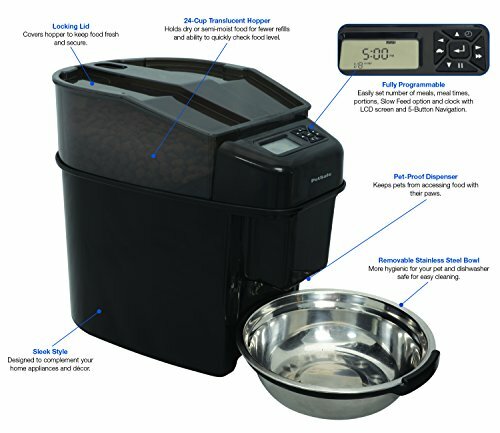 Finding a good automatic dog feeder with timer could prove a struggle, especially with so many options available on the market. Convenient and easy to use, these products will make sure your pet is always fed on time no matter where you are. So, if you consider purchasing one of these feeders, here are some features you should look for. When opting for a new food dispenser, you need to make sure it is safe for your pet. This means chemical-free materials and a sturdy construction. Keep in mind that pets like to play and they might consider the machine as their new playing partner. Therefore, it is crucial for the dispenser to be made of high-quality materials that are non-toxic and resistant against chewing or wearing. Avoid plastic or, if you decided to buy such an item, opt for one that is made of BPA-free plastic. Some feeders are even made of antibacterial plastic, looking after your pet’s health and personal hygiene. Another feature to consider is the type of power supply your product uses. Is it operated with batteries? Can it be plugged into a regular power outlet? Can you do both? How often do you have to change the batteries? In our opinion, the most convenient models are the ones that run both on electricity and batteries. Therefore, if you’re out of town and the power goes off for one reason or another, your pet will still get to eat its meals at regular hours. For more details about specific items and their most important features, refer to some online reviews of automatic dog feeder with timer. 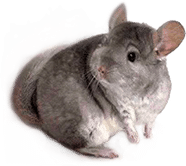 Each pet is different and requires a special feeding routine. Based on its age, gender, weight, and breed, your pawed friend could need bigger or smaller portions of food. A food dispenser allows you to fully customize the feeding process of your pet so that it receives the necessary amount of food without gaining weight. Depending on the product you want to purchase, your dog could benefit from up to six meals per day, each meal consisting of up to 10 cups of high-quality dog food for sensitive stomachs. Keep in mind that pets need to be accustomed to a strict feeding schedule and should avoid eating just once a day. This is the number one reason why they end up gaining more weight than necessary, especially after hitting a certain age. Try to combine a healthy lifestyle with the right type of food, based on your pet’s age category. For instance, if your dog is older than 6-7 years, you should try feeding it organic senior dog food that is rich in fibers and vitamins but low in carbs to promote a healthy digestion and prevent overweight. On the contrary, puppies require as much energy as possible, so their food should be high-calorie, based on quality proteins, vitamins, minerals, and probiotics.